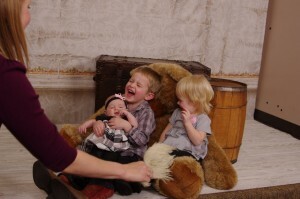 Behind the scenes at a family photo shoot. You can bet these three keep this working gal busy, but I'm sure glad that somebody told me I could have it all! I’m a working mom, so I know all about juggling and finding balance and all that jazz. I also know that sometime (like back in the 70s?) society stopped telling women that they couldn’t have both a successful career and a family. Yet in the cattle industry we often hear that you can’t have it all. Myth: You must choose between things like carcass quality and performance or between end product traits and cowherd function. Fact: If you’re focused, you can put together a well-rounded genetic program that includes all of those things in the same package. Professional Cattle Consultants looked at a cross-section of cattle feeding country (nearly half a million head of data) and found that the highest grading third (72.8% Choice or better) performed better and made more money than the middle and lower third. Nope. Not true. Big ole myth. And I know because Twig Martson reviewed all available research on the subject back when he was at K-State. And then he updated it and found the same thing: zero connection between doability and marbling. Now, that’s not to say it isn’t more work or that it doesn’t take focus, but it’s possible. And it’s so worth it! Sort of like this working mom gig….